January’s labor situation for the U.S. was more than just a single piece of good news, according to Bloomberg Business. The source said it marks a sea change in the labor market in which the middle class and working class are finally starting to get ahead. The unemployment rate increased slightly, but gains were still made across a variety of industries. Overall, economists noted that January’s numbers show impressive economic strength. A total of 257,000 jobs were added and the unemployment figure for the start of 2015 came in at 5.7 percent, a .1 percent increase from December’s rate of 5.6 percent. During January, the nation’s overall workforce grew by 703,000 people. This prompted labor force participation to increase slightly, from 62.7 percent to 62.9 percent. 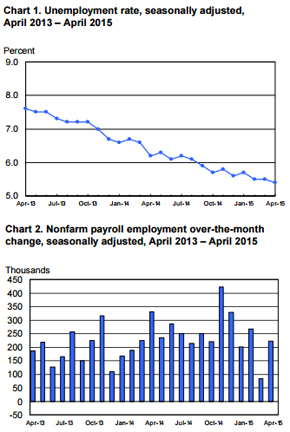 Although the unemployment rate remained largely unchanged, a number of sectors saw their payrolls rise. The retail industry saw the most growth, adding 46,000 positions. Within this sector, sporting goods, hobby, book, and music stores added the most jobs, although motor vehicle and parts dealers and non-store retailers also experienced notable growth. The construction sector grew by 39,000 jobs, with gains in both residential and nonresidential building. Within the sector, specialty trade contractors employment trended up, added 13,000 jobs. The healthcare sector, which has been steadily expanding for months, added 38,000 more jobs during the month of January. The majority of these positions came from doctors’ offices and hospitals, although gains were also seen in nursing and residential care facilities. Financial activities employed an additional 26,000 workers this past month, while the manufacturing industry grew by 22,000. Other industries that experienced job creation were professional and technical services, which added 33,000 workers, and food services and drinking places which added 35,000 jobs. Compensation rates increased in January, following a notable decline in December. While the end of 2014 saw a decrease of 5 cents, January’s average hourly wage went up by 12 cents, coming to $24.75. Average hourly earnings for private-sector production and nonsupervisory employees went up by 7 cents and currently rests at $20.80. Fortune magazine noted that these much-welcome wage increases have been anticipated by economists. As compensation rates climb, it is more likely that the Federal Reserve will raise interest rates. Bloomberg reported that January’s report impressed economists, who had predicted an increase of 228,000 jobs. While the unemployment rate climbed slightly, the source noted that it was likely due to the increasingly positive labor situation in the U.S., which has inspired more people to return to the workforce. The source explained that inflation rates have been kept low due to increasingly weak overseas economies. Inflation is expected to continue to go down as 2015 continues, and industry professionals anticipate that the U.S. will soon have an unemployment rate as low as 5.4 percent. 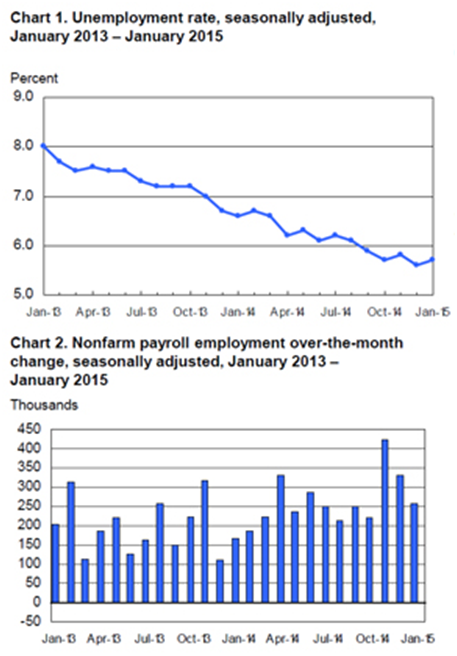 The full Bureau of Labor Statistics report can be downloaded here.